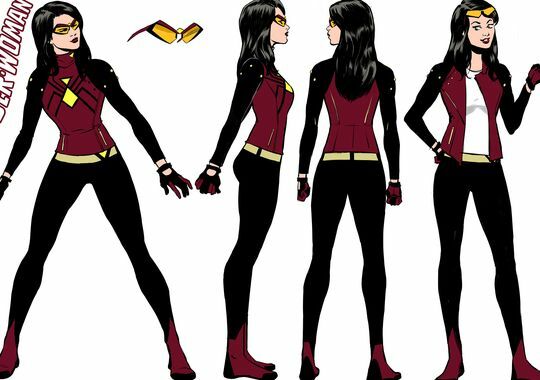 Spider-Woman: 130 pounds and a story of one’s own. The problem with the new Spider-Woman comic is evident right on the splash page. These usually have a capsule version of the character’s origin, so newcomers can get caught up with the story. Only one-third of this one is about our heroine; the rest is about the Inheritors and their war on all things Spidery. 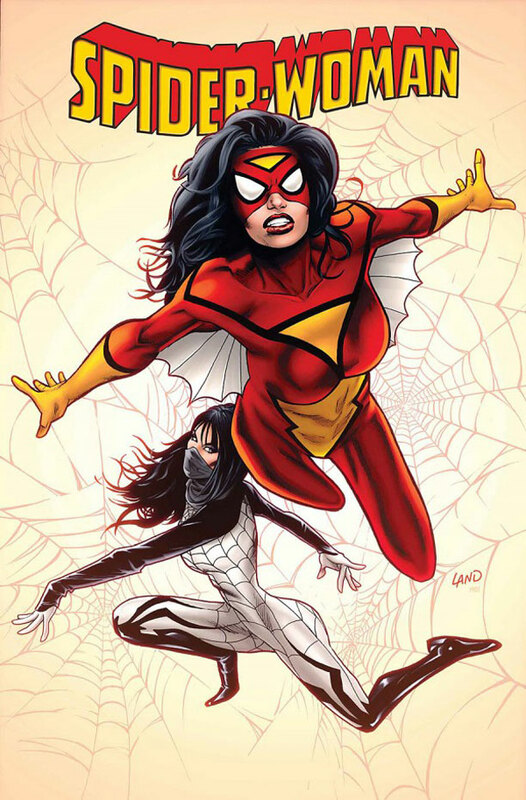 It turns out that Spider-Woman #1 is part of an “event” story in the Spider-verse, with a lot of Spider-characters, and since the last time I read a Spider-Woman comic was back in the 1970s, I was confused. Of course, as with all “events” the point is to get you to buy a whole lot of comics across an array of different series. (Sometimes these are established lines, sometimes they’re spin-offs like the Talon series that spun off from Batman’s Night of the Owls event, or the oddly popular Red Lanterns from the Green Lantern storyline The Sinestro Corps War. It feels as if SW is another one of these, but it remains to be seen if she flops like Talon or takes off like the Reds. But surely if you want to bring back Jessica Drew/Spider-Woman and give her a series of her own, shouldn’t you have a story about her? A story about Silk and her travails could be in a book called, maybe, Silk? Most of the story is about Silk, the villains who are after her, and other Spider-people who are involved in the larger story. SW feels like a bystander in her own book. The story is played as grizzled veteran vs. puppy-dog newbie. SW, who’s been around as a member of S.H.I.E.L.D. and the Avengers, is trying to protect neophyte heroine Silk, since the Inheritors are taking a very unhealthy interest in her. As Jess puts it: “I’ve been tasked with protecting a superhero fangirl with untreated ADHD and delusions of grandeur.” Just as we start to get into the dynamic of Jess and Silk, we are whisked back in time to Prohibition era Spider-Man and his friends, and then today’s Spider-Man and two other Spider-females turn up. The positive thing about all these other characters is that this comic passes the Bechdel Test with flying colours: there are four female characters, and they converse about real stuff. This came just after Marvel made a big deal about trying to attract more female readers. Way to go, guys. Having said that, they are doing a good job with their Captain Marvel, a fighter pilot named Carol Danvers. It’s good to see her get out of the refrigerator. 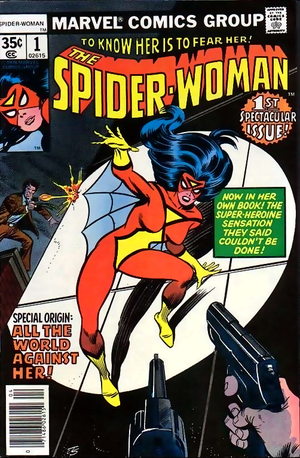 The very first Spider-Woman cover. but apparently that will change as well come March, when Jess gets a new, modern look. It looks like something a real crime-fighting ex-spy might wear. PS – The 130 lbs comes from the Marvel Comics Database, the rest from Virgina Woolf. This entry was posted in Comics, Marvel, Superheroines and tagged Captain Marvel, movie, Spider-Woman, women in refrigerators on February 4, 2015 by solsdottir.